Anniversary Special Edition Racerstar REV35 35A BLheli_S 3-6S 4 In 1 ESC - UK!!! Anniversary Special Edition Racerstar REV35 35A BLheli_S 3-6S 4 In 1 ESC Built-in Current Sensor for RC Drone. 1x Racerstar REV35 35A 4 in 1 ESC. Model: REV35. Current: 35A. -Built-in Current sensor. -4PWM input. 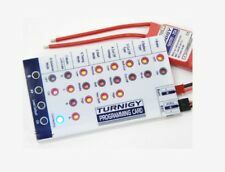 Turnigy Plush ESC (BESC) Programming Card. For use with Turnigy Plush ESCs! No more black magic throttle stick programming! Throw away the manual, you wont need it anymore! Turnigy Plush 6A Brushelss ESC with 5v Bec. The Turnigy Plush series ESC are a high quality ESC well known to experienced hobbyists. Model: Brushless Plush 6A. BEC Output: 5v/.8A. Continuous Current: 6A. Always verify system current draw at full-throttle. Peak indicates amperage sustainable for 0.5 seconds - long enough for most servos' current draw transients. Always confirm servo current draw before the first flight of the model. Hobbywing QUICRUN 2435 G2 Motor 16BL30 30A ESC Combo 1/16 1/18 RC Touring Car. 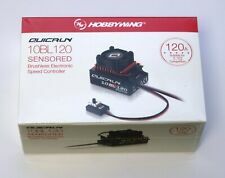 Hobbywing QUICRUN 25.5T G2 3650 Sensored Brushless Motor 1/10 1/12 RC Car Truck. Hobbywing QUICRUN 8.5T G2 3650 Brushless Motor 1/10 1/12 RC Monster Truck Buggy. Hobbywing QUICRUN 10BL60 Sensored ESC 3650 G2 Motor Free Program Card RC Car. Hobbywing EZRUN Max8 V3 150A ESC 4268 KV2600 Motor Traxxas 1/8 RC Truck Buggy. Hobbywing EZRUN Max8 150A Brushless ESC 4268 Motor Traxxas 1/8 RC Touring Car. Tamiya TBLE-02S ESC x2 Brand New From WR-02CB Chassis Kits. Condition is New. Dispatched with Royal Mail 1st Class. Brushless Motor Type: Sensored. Sensored/ Sensorless: Sensored FOC. The motor and ESC are able to match the RPM of the motor to your throttle position under all driving conditions. FOC technology also makes the whole system extremly silent, the motor doesn't create the annoying PWM noise when it is running. Tekin Hotwire. Tekin Hotwire unit. No manual is included but full details are available on the excellent Tekin website. I am always glad to help. Turnigy Super Brain ESC - 60A Turnigy USB Linker for ESC programming. TEKIN VINTAGE CHARGER USED, Untested. Condition is Used. Dispatched with Royal Mail 1st Class. Looks in good condition but untested as I bought in a lot and unwanted. What you see is what you get. 1 x Power Regulator. (It is best to leave more than half of them). Maximum power: 4000 W (resistive load connected). Duplex 2.4ex Central Box 200 Incl. 2 x Rsat2 Jetimodel J CB 200 RS 80001601. · Included 2 JETI DUPLEX 2.4 EX RSAT2. Central box 200, 2 x RSAT2. Many are already in operation Jeti DUPLEX components can be on the DUPLEX 2.4 update EX system. Model: Skywalker - 60a - Ubec. Bec Mode: Switch Mode. Bec Output: 5v@3amp. Refresh Rate: 50hz - 432hz. 210000 Rpm (2 Poles). 70000 Rpm (6 Poles). 35000 Rpm (12 Poles). Maximum Motor Speed Per Minute. Hobbywing 3A UBEC 5V or 6V Switch Mode BEC. The working status is shown by an LED, it lights when the UBEC works normally. Battery polarity reversal protection. Uses an advanced switch mode DC-DC regulator IC. Suit for: DJI F550 650 Quadcopter. 1 x Hobbywing X-Rotor ESC. Current: 40A. Size: Approx.68 x 25 x 8.7cm. Specially optimized software for excellent compatibility with disc-type motors. The colors may be a little difference for the different monitor display. Vintage Futaba Mc210cb Esc Fully working. Hi, Here we have Futaba Mc210cb Esc. Fully working.A bit dusty. HOBBYWING V-TAIL MIXER - 86060060 for RC Plane Flywings. Hobbywing QUICRUN 8BL150 150A ESC & EZRUN 4274 Brushless Motor Free Program Card. 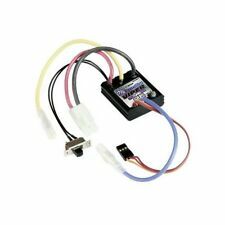 Hobbywing 3A UBEC 5V 6V Switch Mode BEC RC DRONE HELICOPTER AIRPLANE GENUINE. SANWA SGS-01D RC Drift Car Gyro Has has minimal use. Has a slight rip on the front cover but doesn’t effect at all. Dispatched with Royal Mail 1st Class. Input: 2-4cells Lipoly. 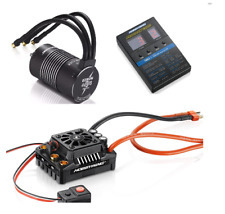 This great new switching mode BEC is the smallest yet made by HobbyKing. Our engineers developed this with micro and race quads in mind. Micro BEC 5V/1A. Type: Switching. Size: 10x9x7mm.